Don’t just think of an elevator speech as a generic tool you can use in chance moments – consider the concept as a strategy to manage multiple talking points, and to communicate more complex ideas as well. Have you ever looked through a kaleidoscope? The slightest rotation and movement of the bits of glass at the bottom of the tube result in a continually shifting pattern of colors and shapes. All it takes is a small adjustment here or there and you have a dazzling montage of new possibilities. I believe the elevator speech can be just as dazzling when pushed or pulled in a different direction or used in a wide range of spaces. Whether you are a business owner, a politician, or a sales professional, the scope of the usefulness of your speech is unlimited. By blending creativity, technology, and a sharp awareness of opportunity, you can successfully take your elevator speech to a new level. In high school and in college, many of us played sports, worked on the yearbook committee, played in the marching band, or participated in some other group or activity. I was on the speech team. I competed in Lincoln-Douglas policy debate and in individual events as well. Much of my time was spent practicing speeches, researching evidence to prove a case, drafting briefs and notes, and I spent countless weekends at speech tournaments. During those years, I learned the value of crafting a variety of different arguments to prove a point. I learned that it did not matter what you thought unless you could build a logical, persuasive argument with evidence to “prove” your case. Ultimately, as a debater, you learn how to craft a variety of elevator speeches and use them individually or to combine several together to build a longer presentation when given the time. This training helped me to repurpose the arguments and content of my messages, or what I like to call “plus-ing” the elevator speech. “Terri, your talk on three-minute elevator speeches is really a spin on what Reagan used to do with his speeches,” John said. “Really? How’s that?” I asked. “I didn’t know that!” I said. What does this mean for you? On various days you might be meeting with or speaking to a wide range of decision makers, clients, and prospects. Why not create a collection of targeted talking points for each of your propositions, arguments, ideas, products, and services? After all, what you want to say to a decision maker in technology will differ from what you might need or want to say to someone in human resources later on the same day. The case you would present to a potential investor would differ greatly from the case you would present to the end user of your services. And of course, someone who donates money to your philanthropic effort might need to hear a different case from the one you present to a corporation that might donate equipment or food to your cause. You do not have to be the president of the United States to get people to listen to you — but you can communicate just as effectively as Ronald Reagan did by learning the art of using the elevator speech concept in a variety of ways. Terri L. Sjodin is the principal and founder of Sjodin Communications, a public speaking, sales training, and consulting firm. For over twenty years, Terri has served as a speaker and consultant to an impressive list of companies, industry associations, academic conferences, CEOs, and members of the United States Congress. 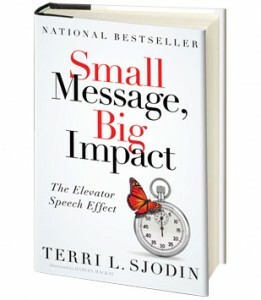 Her new book Small Message, Big Impact: How to Put the Elevator Speech Effect to Work for You is now available in bookstores nationwide. 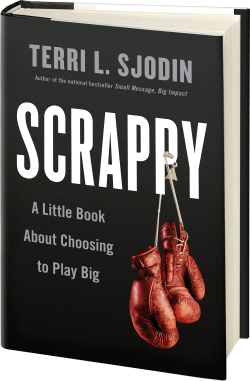 To order your copy today, click here to access your preferred book store retailer.